Everyone who has its website or every SEO professional who want to track their keyword and want to rank their keyword on google or another search engine. They always want a keyword rank checker tool for this.In this article, I am going to tell you 5 amazing keyword rank checker tool that helps you to check your keyword rank. So just go for it. Every blogger or website owner wants more traffic on their website to make money as well as for selling their product. It is very essential for them to track their keyword position. Here some of my favorite keyword rank checker tool that helps you to track your keyword position. SEMrush. SEMrush is a software as a service (SaaS) company based in Philadelphia that sells marketing analytics software subscriptions. It was founded by Oleg Shchegolev and Dmitry Melnikov as an SEO tool and a browser extension before adopting the SaaS model. I think every blogger and SEO professional should know this tool very well. You can create an account easily on it but when you use it free. It shows some of the results that you want but when you use a pro version you will access all the details that you want. The use of SEMrush is very easy. Just go to the website of SEMrush and create a free account which you will use 7 days for free after submitting your card details and if you like this tool you will purchase it after a week. After that sign in your account type your domain and it will show you the full details of your website i.e. how many keywords is ranking on Google or how many backlinks you have as well as your post has. It is an amazing tool. I think you should try this amazing tool and if you want to know more about this tool so comment below. Ahrefs has 1 current team member, Founder and CEO Dmitry Gerasimenko. Ahrefs is basically a paid tool but you can use it a week by giving $7. It is great I think so. It is also a great tool and I am using its pro version. Before getting a higher result on google you just want to know how your competitor works on the same keyword that you are targeting and Ahrefs is that tool that helps you for doing this without any difficulty. Ahrefs is a great tool that providing you your competitor details that helps you to rank your keyword. Just log in to your dashboard and do some initial setting and add your domain and it will also show you how you are performing on SERP. Check your domain backlinks and you can also check your particular article backlinks also. If you want to check your competitor backlinks Ahrefs will also show it to you. Google rank checker is a completely free tool to check your keyword rank on SERP. Just type in google and that’s it no registration no login just type your domain name and keyword fill a captcha and check your keyword ranking. After being an SEO professional I am very fond to do keyword research and after that just thought when my keyword will come on the first page of google. Moonsy is also a free tool that helps you to find the rank of your particular keyword but if your keyword is not standing in the 100 places of search result then it will not show the result. It is one of my favorite keyword rank checker tool. You should definitely use this tool and bookmark it. Seocentro is also a free keyword rank checker tool. Just type your keyword and domain, select your location and that’s it. It will show you the result that where is your keyword is in the search result. So these are the keyword rank checker tools that I am personally used on daily basis. Try them and share your comment with me and if any other tool gives you the best result tell me I will update my post and share it with my visitors. 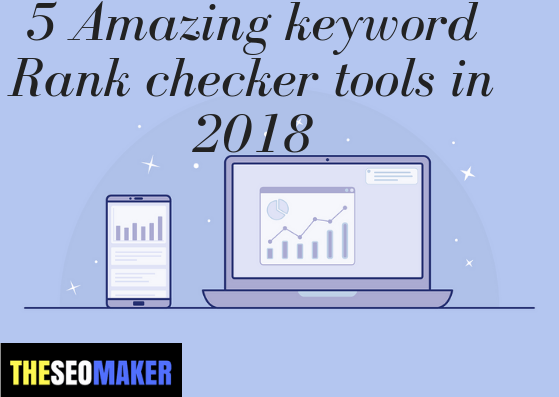 Hopefully, I covered all the best keyword rank checker tools in my article and if I forget to describe some other tools feel free to comment me the tool name I definitely take that tool in my list if it is worth it. So Guys that’s it is my article I think it will help you and help you to find your keyword position. If this article helps you then share it on social media and subscribe my blog.